My parents had five grandkids born in just under five years. Two belonged to my brother. Three belonged to me. Rachel, Joel, Nathan, Micah and Julia. Three boys, two girls. A trio of blonds with a couple of brown-headed ones. The “Fabulous Five” we called them. And they were such fabulous little people. But the last time there was only five was December 19, 2008. My sister married the following day, instantly gaining step-mother status. Madison made number six, and we loved her just as if she had always belonged to us. Eleven months later, my sister gave birth to a baby girl she named Sage. Number seven had arrived. When I remarried on the last day of 2010, I received into my life two new daughters, aged nine and twelve. Megan and Maddie, numbers eight and nine. And then, in the late spring of 2011, my brother and his wife brought Eli home, all the way from Taiwan, bringing the grand total of grandchildren up to ten. In less than three years, The Fabulous Five had grown to The Terrific Ten. 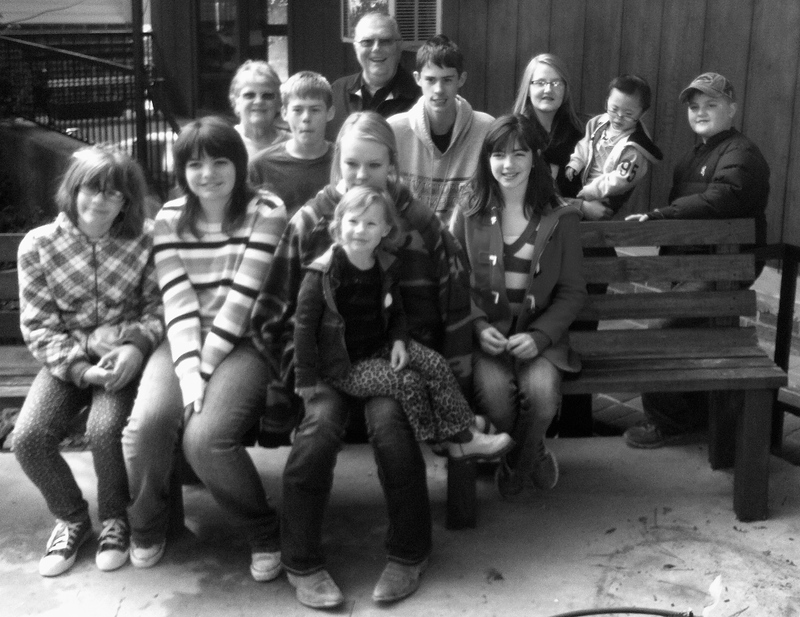 Five new grandkids, joining our family in different ways: marriage, birth, adoption. My parents love them all. Each one belonged. It didn’t matter how they came into our family; it only mattered that they were there. Sure, now there were more Christmas stockings to hang and more birthday gifts to buy. But there were also more hugs and more kisses. More laughter in the house. More cousins to play with on holidays and summer breaks. The house might burst to overflowing, but who among us would have it any other way? 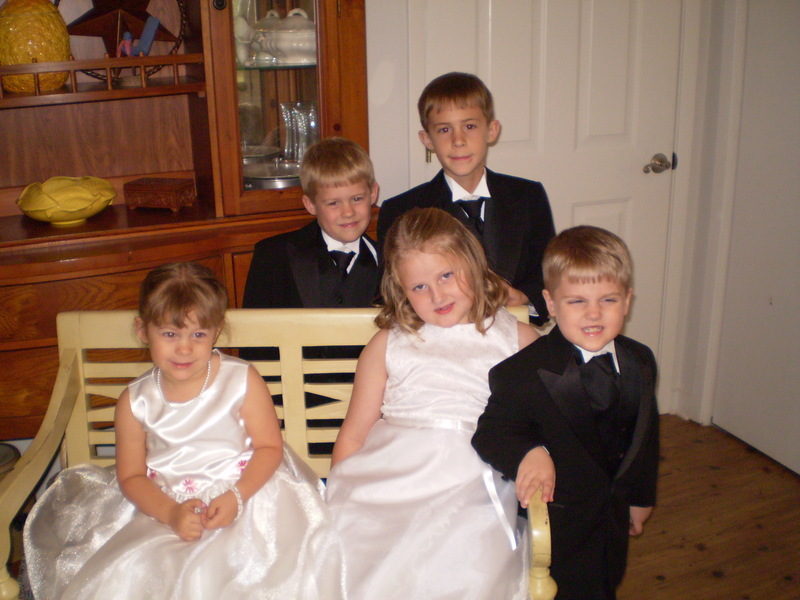 Of the Terrific Ten, I have the blessing of being Mom (or GiGi) to five. My own little group of fabulous people. After three years of marriage, Jon and I have grown accustomed to the strange looks we receive when we take our family out. There are seven of us. The children are close in age. Julia, the baby, is ten. Maddie, the oldest, is fifteen. Life at my house is never boring. It’s always loud. It’s always active. Most of the time, I love it. Yet there are moments when I want to run away from the ruckus and the chaos. Of course not! It might not be easy, but at the end of each day I am more blessed by these five children than I am by any other part of my life. God reveals Himself to me through them. And I cannot imagine no longer being their mother. Today Jon took me to a Focus on the Family event called Wait No More. It’s intention was to awaken Christian families to the more than 100,000 American children in foster care waiting to be adopted, and the approximate 143 million orphans worldwide. Children who have endured so much pain, grief, sorrow and abuse in their young lives. They didn’t ask for or deserve to live the life handed to them. More than anything, they need a family. They are all waiting for someone to open their arms and welcome them home. I sat and listened, taking in stories shared by adults who told of their childhoods growing up in foster homes, parents who had fostered and adopted children into their families, biological children of foster/adoptive parents who loved their new siblings, and social workers. I laughed. I cried. Mostly I cried. It is not lost on me all this happened on Mother’s Day weekend, which brings me back to thinking of my own family and my fabulous five children … and what all of this might mean for Jon and for me and for our kids. I honestly don’t know. Maybe we will foster. Maybe we will adopt. Maybe we will foster to adopt. God hasn’t set before us a clear path yet. when I can look back to the time when there were only five. Wow– sounds like you’ve got some thinking & praying to do. What a wonderful possibility! I’ll be praying for you. Keep us updated! I’m sure there will be plenty of updates here. 🙂 Thanks for the prayers. We definitely need them … right now, just praying for the right direction to start. Jon and I have agreed on a starting place, but neither of us is absolutely certain this is the right direction, but we have faith that God will reveal His plan as we move in faith. Wow – what a blessing for these kids! As a foster parent, I can tell you that it’s a crazy ride, but absolutely worth it. We’ll be praying for you guys as you consider this new adventure! I’d love to hear more of your story … how you got started with fostering, experiences you’ve had, lessons learned, advice, etc. Do you have posts on fostering on your blog? Do you have any biological children as well? Are you planning to adopt the children you foster? I know, I have lots of questions. Don’t feel pressured to answer them all! Ha! Just eager to talk to a foster parents. I’ve got lots and lots of friends who have adopted, but don’t really know of anyone who fostered. Definitely more family stories to read from you. Big families are great fun. I speak being one of ten (nine natural born, and one foster child). In my adult life I have fostered two children, and was blessed to be able to adopt one of them. Now 30+ years later, I still keep in touch with my former foster daughter. My adopted daughter is thriving with two children of her own. Definitely there are lessons to be learned in fostering children and adoption. I wouldn’t trade the experience for anything. My prayers are with you as you make decisions. Big families are fun! I’m glad to hear that you don’t regret your history with fostering & fostering to adopt. I am encouraged by people who continue to give me positive feedback, telling me it will be hard but a blessing as well. I have to admit: I am scared to pieces, but mostly I want to know I did my part to be a blessing to someone else even if it means hard work in the process. Thanks, Janice!